Why Do Some Fellas Look Good With A Mustache And Others Look Like A Narc From The 1970s? Thread: Why Do Some Fellas Look Good With A Mustache And Others Look Like A Narc From The 1970s? I fall into the latter category. Not sure if it's something to do with my nose or mouth or something else. I either go clean shaven or grow a full-on Jihadi beard. My dad was lucky as he grew an amazing evil black mustache. Re: Why Do Some Fellas Look Good With A Mustache And Others Look Like A Narc From The 1970s? Do heterosexual men grow mustaches? 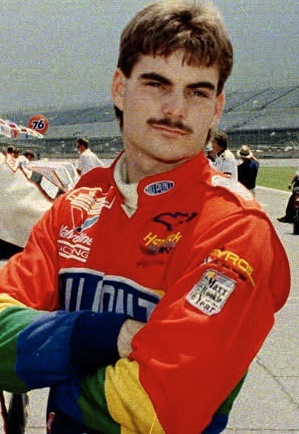 Jeff Gordon realized that he looked like a child predator and either went clean shaven or grew out the scruffy look after that "unfortunate" grooming choice in the 90's. 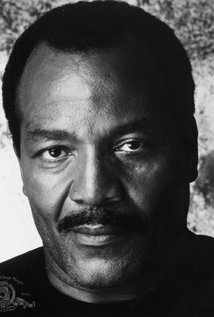 Then you've got people like Jim Brown. As one heterosexual man to another, I can say, dude looked good with a 'stache. Course, even if he didn't, who would have the balls to say anything? Even at 80 something, he could still probably knock you out with one punch. Plus, any guy who banged Raquel Welch til she couldn't walk straight for days, gets respect forever. I would throw Charles Bronson in there too. But he sometimes took on a Frito Bandito look with his 'stache. My dad looked good with a moustache. Me? I have to include a goatee to look right. Charles Bronson had the best bad mustache ever. He had 4 long hairs on his upper lip that he was able to wrap around and twist around until it looked good. I feel sexually inadequate about this topic. I think that anyone can pull off a beard.. a mustache, not so much. My personal favorite, though.. the most difficult of growths ~ mutton chops. Have I ever had them? Yes. Was I perhaps 'delayed' from entering society for a few years? Yes. Did this give me time to try 'em out, except that D.O.C. meals perhaps dont have a ... an 'ideal' amount of calories for doing such? Yes and yes. 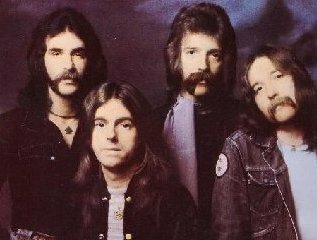 There are mustaches and there are Foghat mustaches. Roger Earl and Rod Price gave many female ( maybe some dudes too)fans a slow ride on their muff dusters. How about a mustache known as the Steely Dan? Imagine how many gals have taken a ride on that over the years? It's just one of those mysteries of life. The same way some women can look good with a stud piercing on their upper lip, while most just look stupid. When any government or church for that matter, undertakes to say to its subjects, "This you may not read, this you must not know," the end result is tyranny and oppression, no matter how holy the motives. Do you speak English? Certainly. And I understand American. 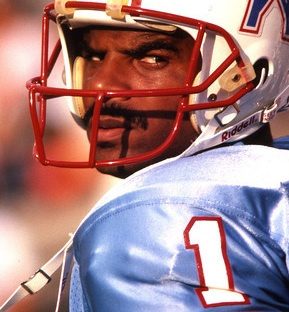 During his football hall-of-fame enshrinement speech, he credited his moustache in part for gaudy numbers he put up in the run-and-shoot offense for the Oilers (citation needed).